Cheese consists of proteins and fat from milk. In general, milk of cows, buffalo, goats, or sheep is used in making cheese. It is produced by coagulation of the milk protein casein. Typically, the milk is acidified and addition of the enzyme rennet causes coagulation. Some cheeses have molds on the rind or throughout. Most cheeses melt at cooking temperature. The word cheese comes from Latin term caseus. Evidence of cheese-making dating back to 5,500 BC is found at Kujawy, Poland, where strainers with milk fats molecules have been found. In December 2012, scientists have reported to have discovered pottery fragments that are the oldest piece of evidence of cheese-making ever found along a river in Poland. By Roman times, cheese was an everyday food and cheesemaking a mature art. United States, Germany and France are the top three cheese producing nations. France, Germany and Netherlands are the top three Cheese exporting nations. Greece, France and Iceland are top three Cheese consuming nations. Swiss cheese are easily recongized by their holes which punctuate the pale yellow exterior. The holes on the Swiss cheese are called eyes. They are caused by the expansion of gas within the cheese curd during the ripening period. "Big Wheel" and "Big Cheese" are used to refer to those who were wealthy enough to purchase a whole wheel of cheese. Cheese is made from milk and it takes around 10 litres of milk to make 1kg of hard cheese. Cheese can be made from lots of different types of milk, such as buffaloes' milk, sheep's milk and goats' milk; most of the cheese eaten in the UK is made from cows' milk. We all know that "Little Miss Muffet sat on her tuffet, eating her Curds and Whey" but I bet you didn't know that to make cheese, milk has to be separated into curds which are the lumpy bits and whey which is the liquid bit. We make cheese with the curds! Some cheeses, like Mature Cheddar, are stored for one year or longer before they are ready to eat. They are kept in special rooms and sometimes even caves! There are over 700 different named cheeses produced in Britain. Cheddar is named after the Cheddar Gorge caves in Somerset where the cheese used to be stored to ripen. Cheddar is one of the most widely made cheeses in the world. King Henry II declared Cheddar cheese to be the best in Britain! The majority of Shropshire Blue is not actually made in Shropshire, but in Leicestershire and Nottinghamshire. Cheshire is one of the oldest British cheeses. It dates from Roman times and even gets a mention in the Domesday Book. Caerphilly was traditionally eaten by Welsh coal miners for their lunch. Every spring sees locals in the village of Stilton, Peterborough, race along a course rolling Stilton shaped wheels. Cheese comes in many different colours, textures, tastes and appearances. They can be hard, soft and some are runny! Cheese is packed with the protein that we all need for growth and development. Hard cheese is source of calcium with a matchbox-sized piece providing a third of an adult's daily requirement for calcium. Cheese is a source of vitamin B12, which you need for red blood cell formation. Each day our friends in France, Italy, Greece and Germany eat more than twice as much cheese, per person, as we do. America has 440 cheesemakers. Cheddar is the best-selling. A farm in Sweden makes moose cheese. The most recognizable characteristic of Swiss cheese is its holes which punctuate the pale yellow exterior. These holes, also called "eyes," are caused by the expansion of gas within the cheese curd during the ripening period. Some acient Roman houses had a special kitchen, called a careale, just for making cheese. Some cheeses are stored for one year or longer before they are ready to eat. Pizza Hut uses about 140 million kilograms of cheese per year. About 10 gallons of milk are required to make one pound of cheese. Cheese and milk account for more than 51 percent of the calcium in adult diets. 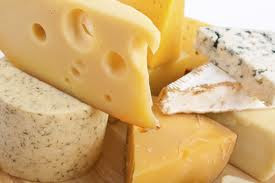 Cheese and milk are top sources of zinc, phosphorus, riboflavin, potassium and magnesium.